Thrive Ultimatum Review 2019 [Updated] - Is it the Best Scarcity Plugin? Thrive Ultimatum WordPress Plugin is another excellent scarcity based marketing tool from Thrive Themes. Scarcity technique helps marketers and product vendors to generate more sales. I am a big fan of their products such as Visual Content Builder, T﻿﻿hriv﻿﻿e Leads, and Themes. In this post, I am going to share, an indepth review of Thrive Ultimatum plugin. Every marketer and blogger wants to get more sales to make more commission. Thrive Ultimatum comes with exclusive features which can help you generate more sales, leads, and money. In this Thrive Ultimatum Review, I have shared everything, its benefits, creating campaigns, designs, and triggers, etc. 7. How to Add Thrive Ultimatum Widget in Website? So, Should I Buy Thrive Ultimatum Plugin? Thrive Ultimatum is a recently launched wordpress scarcity plugin by ThriveThemes. It is the best tool to create countdown campaigns and offers on the website. With this plugin, you can design campaigns with drag and drop feature. If you are using all Thrive suits, then you will see that its drag and drop builder is similar to Thrive leads and clever widget. It is also integrated with leads group and shortcodes so you can use lead generations with countdown feature. The plugin also allows to integrate it with mailing list builder(Aweber, Mailchimp, GetResponse, etc.) to use auto responder and lockdown feature. The plugin provides amazing features for affiliate marketers and eCommerse website to boost up leads and sales. Below, I have described every feature of Thrive Ultimatum and How-To-Use with snapshots. In Ultimatum dashboard, you can add, modify and manage multiple campaigns. You can also prioritize campaigns by drag and drop from right to left (or vice versa). At the dashboard, you can monitor impressions of each campaign you create. There are three built-in templates. So, you can choose one of these templates to create quick campaigns without investing a lot of time. However, you can create your own campaign template from scratch to make a unique one. Thrive Themes has mentioned that they will add more template soon in the feature. Christmas Special: Ideal for events such as Christmas, Black Friday, and Fathers day, etc. Use this event if you want to display discount or product that have a start-and-end date. You can set absolute start and end date of a campaign with this type. For instance, an offer that is started on the 8th November and ends on 12th November. This site wide event is very useful if you are selling something with discounts that happens on a specific date every month or year. You can display campaigns repetitively on a specific date every month or year. For example, if you made an offer that starts on 5th then it will repeat again on the 5th of next month after that. This is the best campaign type to create recurring offers and promotions that happen every month or year like Black Friday, Christmas, Halloween, etc. This type of campaign can be used for an offer that is not triggered by a date, but by a user action. For instance, an offer that shows 7 Days after a new user signs up for your newsletter. So, it can help to increase leads and sales by show individual campaigns and promos to targeted subscribers. Isn't great way to increase leads or generate more sales? This trigger type will display your campaign to those visitors who are signed up to one of your selected thrive leads groups or shortcode. You can use this feature only if you have installed thrive leads on your wordpress site. This trigger type will display your campaign to first-time visitors of your website. This trigger type will start showing your campaigns to those visitors who have visited a particular page or post of your website. After selecting this feature, you can select each or multiple pages and posts of your site. Even, you can select tag, category or archives. Thrive Ultimatum display mode have a very similar interface to Thrive leads and clever widget. In this mode, you can target any piece of content on your websites such as page, post, category, achieve, post types and page template. Even, you can choose each or multiple pages or posts. So, you can show your campaigns to a targeted audience. As I am using W3 Total Cache plugin, this is why a warning notification is showing. If you also have installed any cache plugin, make sure to clear cache every time you make a change in this section. Ultimatum provides three design types areas where the offer will be displayed on your website. I have described these design types below. Top Ribbon: This design type will show your offer at the top of the screen. This plugin includes 6 built-in responsive templates for top ribbon, you can choose any of then and can customize it with Thrive drag and drop builder. However, ThriveThemes has mentioned that they will add more built-in templates in the future. Bottom Ribbon: This design type shows offer at the bottom of your screen. It also has 6 pre-setup template and all functions similar to other designs. Ultimate Widget: This design type is used to display an offer in any widget area on your website. In Widget template gallery, there are 6 built-in models similar to top ribbon designs. You can choose and can customize then too in the builder. Thrive Ultimatum comes with 16 pre-built campaign templates that you can use as top ribbon, bottom ribbon, and sidebar widget. Templates are completely customizable with Thrive visual editor. It also allows saving custom designed template if you want so and saved templates can be used for the future campaigns. You can activate ultimatum widgets by going to Appearance>Widgets. 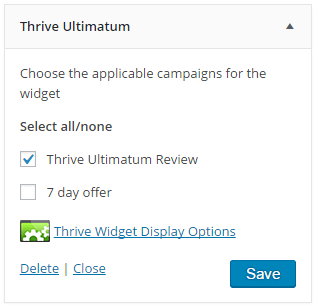 You can find Thrive Ultimatum option in the available widgets area nearby to wordpress side menu. Drag it to the sidebar, after that widget settings will appear. You can simply select a campaign from there. With Ultimatum conversion event setting, you can choose if you don’t want to display product to a visitor who have purchased the product already. But how it works? So simple. In conversion setting, you can set to not display campaign to the visitor who have reached the “Thank you for Purchasing” page. So, your visitors will no longer see promotions of purchased product. However, one of the powerful features of this setting is that you can also choose to display another offer if he/she has purchased older one. Snapshot is given below of this setting page. It also allows adding multiple “Move to Another Campaign” feature. Thrive Ultimatum provide another fantastic feature for eCommerse and affiliate marketing website which is lockdown or auto responder option. With this feature, you can send campaign page links to peoples of your mailing lists and can trigger a campaign easily. Let me explain How Lock Down Feature works? Suppose, if you are running a promotion to somebody, you can create a link in your email follow up series or in list builder (Aweber, Mailchimp, GetResponse, etc.) on which they will click. That link will redirect them to another page depending on where they are in the campaign. In this feature, there are three following redirect options. 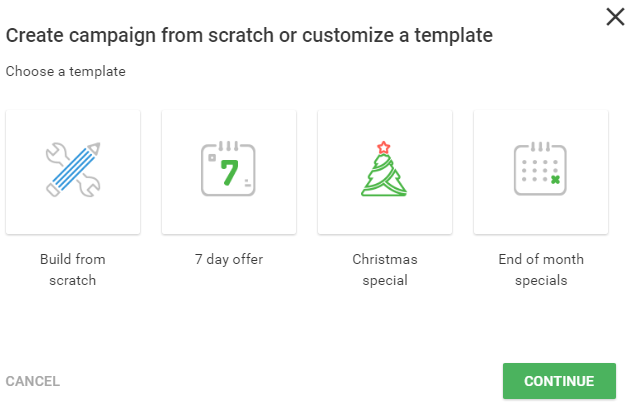 For example, if you are running a 7-Days evergreen campaign on your website and the user has not triggered the evergreen campaign yet or if the user has not seen the campaign yet. Then the user will be redirected to pre-access page URL. So usually, this will be a sign-up, access page, or subscription page. If the user is already in the promotion, then he/she will be redirected to the promotion page URL, if the campaign is running at that time. So, generally, that will be the product sales page from where the user will make a purchase. Now, if the promotion countdown is expired or its ended, then you can redirect your subscribers to campaign expired page URL. Generally, it will be a “Sorry Current Offer is Expired” page. So, you can create three different page links on where the user will redirect. After setting up campaign pre-access page, promotion page, and expired page, The next step to do is generating an email link from the auto responder you have integrated with your website. This is a very clever option that will redirect your subscriber depending on where they are on the campaign. One of the best thing about lockdown feature is that it absolutely perfect and bulletproof, and does not matter if the user has changed browser, device, cleared cache or open link in incognito or private mode. It can not be cheated. Check out the snapshot of LockDown option page. Timeline event is another powerful feature that Thrive Ultimatum provide. With this feature, you can set the duration of campaigns state so you can do A/B testing of different designs and promotions. The timeline is another scarcity strategy which is very useful to get more leads by adding a limit of time to purchasing product. For example, if you are running a campaign for 5-Days and want to add different designs of every day offer. So, you can do that by using Timeline event feature. You can add multiple timeline events and various campaign widgets. Check out the snapshot. Here I have added 2 campaign designs top ribbon, and widget for the sidebar. Both campaigns have the same and after that time, the campaign designs will automatically change. You can use three designs at the same time with this feature and add multiple duration for each one. Thrive Ultimatum comes with two plans right now, One for a Single Site at $97, 5 websites license comes with $147 and the last plan comes with $399 which can be used on 15 websites. It is one time payment and you don’t have to pay again but you get updates/support for 1 year. Thrive Ultimatum is the best and easy-to-use scarcity tool with many pre-built features. But in case, if it doesn’t fulfills your requirement or fail to satisfy you, then you can refund within 30-Days according to their money back guarantee policy – no questions, just refunding. Below are the plans and prices. Install & activate the plugin on your one website. Install & activate the plugin on all websites you personally own. Yes, of course. I am a big fan of Thrive products and personally using their theme and plugins on my website. I recommend their product including this new scarcity based ultimatum plugin. There is no doubt that every product they provide is awesome, minimal coded, responsive and best to attract viewers attention. I am using their Leads plugin to build an email list and Visual Editor to craft stunning looking post formats. It is so far the best drag and drop plugin for creating sales, squeeze, leads, and landing pages within minutes. Thrive Clever Widget is another great tool to show specific stuff on specific pages like on category, tag, posts or pages. With this plugin, you can generate more sales by showing highly targeted products to the targeted audience. I would highly recommend Thrive Ultimatum Plugin if you want to get more sales and more money with your existence audience. Good question, you can create scarcity based top/bottom notification bars, sidebar widgets to entice/insist visitors buy a particular product before the deal ends. For instance, create a campaign to show a discount deal and insert a scarcity element such as "Time Limited discount offer, grab it now; otherwise, you have to pay double." Easy enough to understand and this is a great marketing strategy to get more sales. Please don’t forget to write your thoughts about this Thrive Ultimatum Review in the comments section. And how many stars you would like to give this Thrive Plugin? Thrive Ultimatum wordpress plugin is one of the best, easy to setup, and time-saving marketing tools. Using it you can generate 2x more sales by implementing scarcity technique in your sales pages.